Ticket Categories allows Tickets in a TicketBox to be easily sorted by a common option. This allows for easy sorting and prioritizing when viewing a TicketBox. Ticket Categories can also be used in several reporting options. Company A has a Support TicketBox within VisNetic MailFlow. Within this TicketBox, the Ticket Categories display which product the support ticket is related to. Allowing Agents who are responsible for monitoring the Support TicketBox to easily see which products are needing attention. The same example can be used for a Sales TicketBox. The same categories can be used to easily display which product the sales team is getting inquiries for. To automatically assign a Ticket Category to a Ticket you must setup a Processing Rule. 7. Next enter the text you wish to match on. NOTE: When matching on a phrase, surround the phrase in quotes ie: "This is a test" When matching on an individual word, just enter the word with no quotes. Now that the Processing rules are created. You can enable Custom Routing Rules to use the Processing rules automatically. 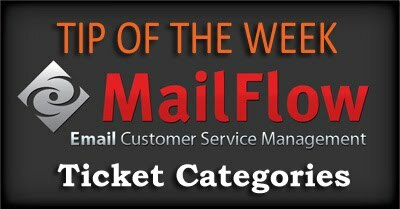 This allows for the Ticket Category to be automatically assigned to a Ticket once its brought into MailFlow. NOTE: This will need to be done for all Custom Routing Rules you wish to have use the Processing Rules.